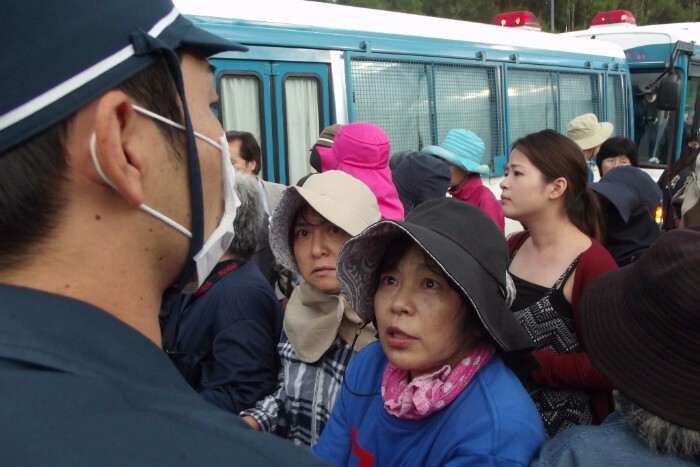 Riot police poured out of buses at six a.m., out-numbering protesters four to one, with road sitters systematically picked off in less than an hour to make way for construction vehicles. 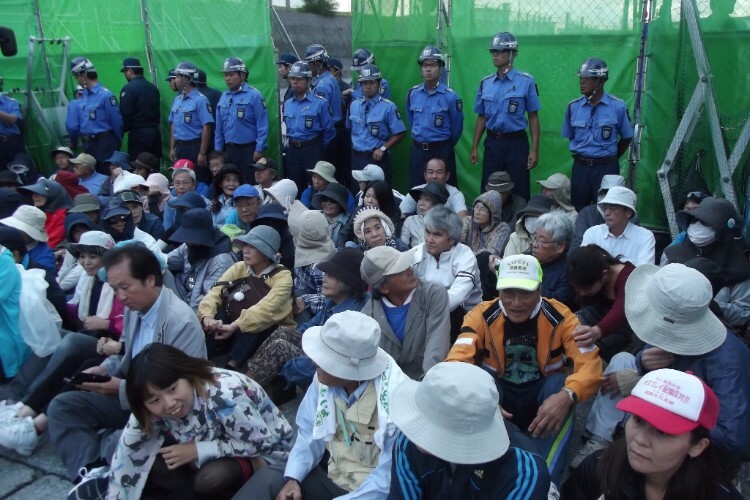 All the mayors and government representatives of Okinawa have objected to the construction of the new coastal base, which will landfill one hundred and sixty acres of Oura Bay, for a two hundred and five hectare construction plan which will be part of a military runway. Marine biologists describe Oura Bay as a critical habitat for the endangered ‘dugong’ (a species of manatee), which feeds in the area, as well as sea turtles and unique large coral communities. The bay is particularly special for its extreme rich ecosystem which has developed due to six inland rivers converging into the bay, making the sea levels deep, and ideal from various types of porites coral and dependent creatures. ‘Camp Schwab’ is just one of 32 U.S. bases which occupies 17% of the Island, using various areas for military exercises from jungle training to Osprey helicopter training exercises. There are on average 50 Osprey take off and landings every day, many next to housing and built up residential areas, causing disruption to everyday life with extreme noise levels, heat and diesel smell from the engines. Two days ago there were six arrests outside the base, as well as ‘Kayactivists’ in the sea trying to disrupt the construction. 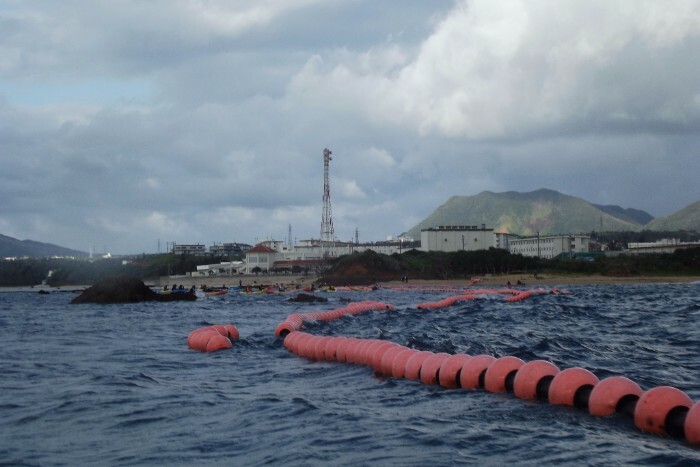 A formidable line of tethered red buoys mark out the area consigned for construction, running from the land to a group of offshore rocks, Nagashima and Hirashima, described by local shamans as the place where dragons (the source of wisdom) originated. Protesters also have a number of speed boats which take to the waters around the cordoned area; the response of the coast guard is to use the tactic of trying to board these boats after ramming them off course. 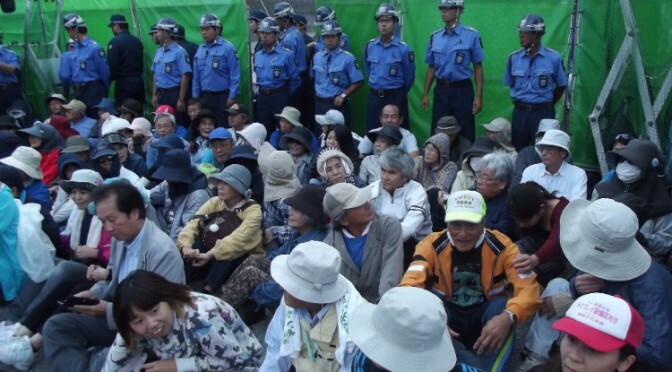 The overwhelming feeling of the local people is that the Government on the mainland is willing to sacrifice the wishes of Okinawans in order to pursue its military defense measures against China. Bound by Article 9, Japan has not had an army since World War Two, though moves by the Government suggest a desire to scrap the Article and embark on a ‘special relationship’ with the U.S., who is already securing control of the area with over 200 bases, and thus tightening the Asia pivot with control over land and sea trade routes, particularly those routes used by China. Meanwhile, Japan is footing 75% of the bill for accommodating the U.S., with each soldier costing the Japanese Government 200 million yen per year, that’s $4. 4 billion a year for the 53,082 U.S. soldiers currently in Japan, with around half (26, 460) based in Okinawa. The new base at Henoko is also expected to cost the Japanese Government a tidy sum with the current price tag calculated to be at least 5 trillion yen. Okinawa suffered devastating losses during the second world war, with a quarter of the population killed within the 3-month-long ‘Battle of Okinawa’ which claimed 200,000 lives in total. Hilltops are said to have changed shape due to the sheer bombardment of ammunition.